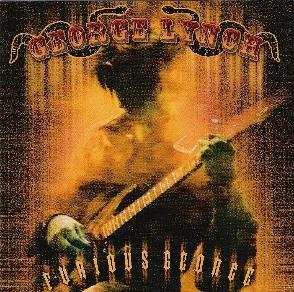 George Lynch - "Furious George"
While I can't say that I have followed George's career after Dokken, who I saw twice in concert, including a show where he passed out! I was surprised by the biography that George was now 50 and had been playing in bands in the mid 70s'. That explains a lot when you see the incredible compilation of tracks he has decided to cover on this CD. The liner notes are also excellent with George's description of how each band influenced him. On this CD George is backed by Jeff Martin on drums, Kevin Curry on Rhythm guitar, Gunter Nezhoda (also played bass on the Michael Schenker CD of cover songs released on Shrapnel), and Kelly Keeling on Vocals. The band all play excellent. Kelly has a great voice and feel for how to sing these classic songs by Montrose, Hendrix, Grand Funk, Captain Beyond, Deep Purple, ZZTOP, Robin Trower, Cactus, The Beatles, Mountain, Willie Dixon and Leadbelly. This is a highly enjoyable CD and I think my favorite tracks are "Space Station No. 5" (the opener), "I want You/She's So Heavy", "All along the Watchtower" and "Dancing Madly Backwards". For more information you can visit the George Lynch web site at: http://www.georgelynch.com.